Manushi Chhillar And Sushmita Sen Met Mid-Air— Find Out What Happened Next! Home BOLLYWOOD Watch: When Manushi Chhillar And Sushmita Sen Met Mid-Air! Watch: When Manushi Chhillar And Sushmita Sen Met Mid-Air! Manushi Chhillar and Sushmita Sen bumped aboard a flight— read to find out what happened next! The new Miss World Manushi Chhillar is basking in the glory of her recent victory. The 20-year-old girl from Haryana won hearts with her honesty and of course her smile. Similarly, Sushmita Sen too, made hearts race with her dazzling smile and witty answers. So what happens when the beauty queens meet midair? The video of the two beautiful women meeting has gone viral! 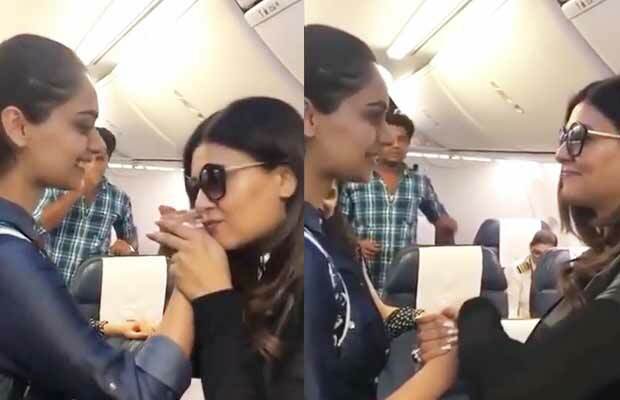 In the old video, we see Manushi and Sushmita bumping into each other when aboard a flight. The video was shot back when Manushi was just Miss India preparing for the Miss World pageant. The former Miss Universe of 1994 also kissed Manushi’s hand. Perhaps that was all the luck that Manushi needed to become the Miss World— a kiss of good luck! Manushi ended the 17-year drought of India winning an international beauty pageant. Last time India saw a beauty crown was on Priyanka Chopra’s head in 2000. Priyanka Chopra won the Miss World pageant then. Dia Mirza won titles of Miss India and Miss Asia Pacific in 2000. The entire trend was started by Sushmita Sen’s victory of Miss Universe 1994. In the same year, we also saw Aishwarya Rai being adorned with the Miss World crown. After that, we saw Reita Faria from India winning the Miss World 1966. She was the first Asian to do so. She now lives in Dublin, Ireland and has a medical practice of her own. Later Diana Hayden won the Miss World 1997. Actress Yukta Mookhey too won the Miss World 1999. After that, we saw Lara Dutta being crowned The Miss Universe in 2006. As for now, Manushi Chhillar has no plans to follow the star-studded path that Sushmita Sen is on. Manushi plans to concentrate on her MMBS studies for the meanwhile. After that, she plans to travel the globe for a social cause. Although, a movie opposite Aamir Khan might tempt her! Nudge, nudge Aamir… What are you waiting for? Previous articleBigg Boss 11 Poll Results: Viewers Want This Contestant To Get Evicted From The Show! Next articleTiger Zinda Hai: Salman Khan Paints A Portrait Of Katrina Kaif On Ice And You Will Be Amazed!